There's so much wrong with Amber Rudd's tweet on a basic level that it's difficult to know where to start. Consider the absurdity of an actual government minster using emojis as bullet points to pretend that they're down with the kids. Consider the unbelievably patronising tone of "I am going to share these good stories with you". Consider the fact that anyone with the slightest grip on reality can see that this is a desperate effort to whitewash the fact that Universal Credit is a massively delayed, incompetently administered, poverty-spreading, and deeply unfair reform to the social security system. And just listen to the awful saccharine feelgood background music on the propaganda video she's shared. But aside from all of the obvious flaws there's something else. Charlie isn't just a personal trainer as is implied in the Tweet and the video, he's actually a professional actor, which is rather a large omission given the Tory DWP's history of inventing fake claimants to provide fake quotes about how great Universal Credit is. 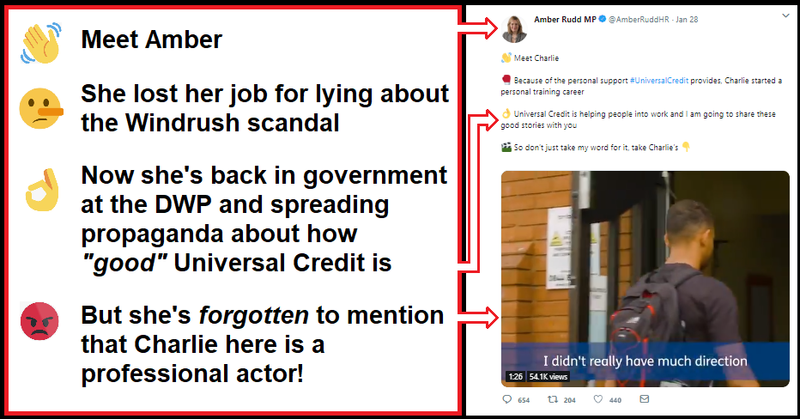 The Universal Credit blogger Alex Tiffin spotted the fact that Charlie is a professional actor and shared several pictures of him doing professional acting work for companies like Sky Atlantic and Vodafone. The choice not to mention Charlie's apparently extensive acting work is an example of deception by omission, and the presentation of this professional actor as if he's just some Ordinary Joe member of the public is downright dishonest. The choice to pick a professional actor to play the role of someone who supposedly had their life improved by Universal Credit (rather than ruined by it like most people who experience it) leads to the suspicion that they couldn't actually find any real ordinary people to speak positively about it at all. One of the worst aspects of this Tory propaganda is that deceptions and lies from the Tory government have become so commonplace these days that nobody is even surprised by them any more. There are the dupes who still actually believe the lies and deceptions, but even when the dishonesty is revealed, a significant proportion of people have become so normalised to it that they respond with a shrug of the shoulders and a "what do you expect?" attitude, rather than fury that the government is demonstrably being run by a pack of lying propagandists. 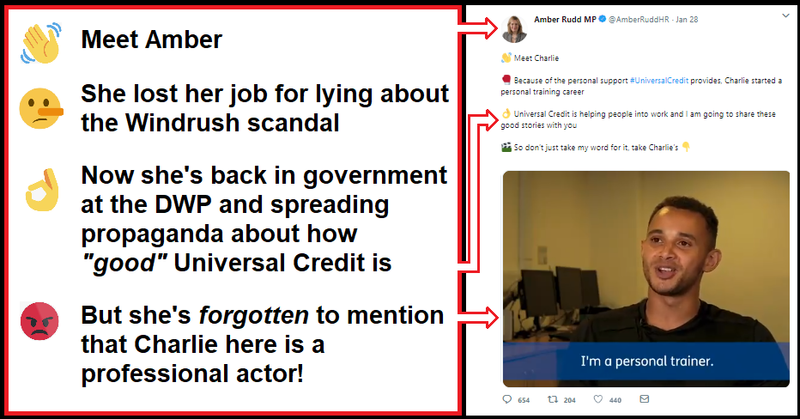 Amber Rudd resigned in disgrace over the lies she told about the Windrush scandal, but then she was brought straight back into government within a matter of months to take over the DWP and the Universal Credit fiasco. And this Tweet is evidence that she's clearly learned nothing about honesty or integrity from her extremely brief non-punishment on the back benches. 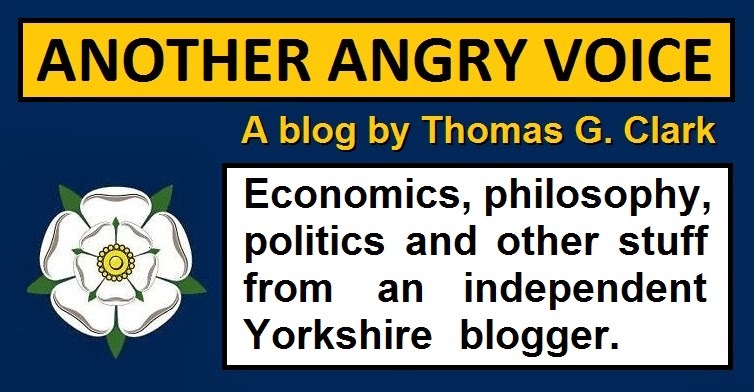 It's a very dangerous road we're heading down when our government deceives us and lies to us on such a regular basis that most of us end up reacting to it with apathy, not anger.